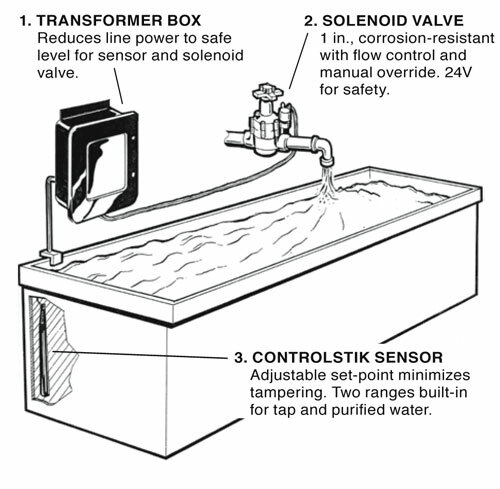 Rinse water usage shall be minimized by means of automatic conductivity control systems. They shall consist of a temperature compensated conductivity sensor, corrosion resistant one-inch solenoid valve, and transformer box which safely reduces line power to the sensor. Enclosure shall be fiberglass with heavy rubber gasket and 316 stainless steel. Circuitry shall be solid-state, and unaffected by changes in voltage. Setpoint adjustment shall be on sensor to minimize tampering. 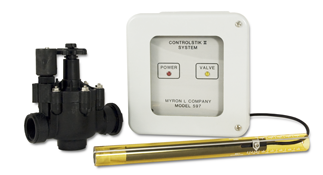 Rinse tank controls shall be Myron L® Model 597 or approved equal. Input Power: Choice of 110 or 220 VAC, 50/60 Hz; Automatic voltage regulation insures operation of the systems from 105-125V or 210-250V respectively. Enclosure: IP65/NEMA 4X fiberglass case with gasket and 316 stainless steel hardware. Dimensions: 184 H x 197 W x 127 D mm/ 7.25 H x 7.75 W x 5 D in. Dimensions: 304 L x 25 Dia. mm/12 L x 1 Dia. in.